Posted on Mon, Apr 2, 2012 : 7:04 a.m.
Can you spot the tree? Last summer, we planted a stick in our front yard — at least, it looked like a stick. 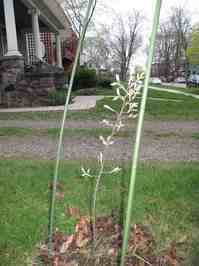 More specifically, however, we planted a serviceberry “tree” in seedling form. We had to mark the site with gardening stakes to remind ourselves and others not to mow or trod on our delicate new plant. We wanted to give our new tree a fighting chance. As far as trees go, it's very cute... small and cute. 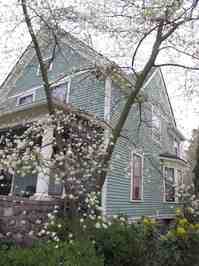 Our inspiration for this act was our neighbor’s lovely serviceberry tree, which is a lofty two stories tall. Hers is a gorgeous tree, with striking dark bark and elegant horizontal limbs. Each spring, the branches are decorated with fistfuls of white blossoms. By June, the flowers fully ripen into deep blue-purple berries, and we vie with the birds to see who can get more enjoyment out of the harvest. We have helped our neighbor harvest berries, and then we eat them fresh or bake them in pies. Our tree is several seasons away from the fruiting stage, but it’s growing. It’s already significantly taller than last year, and it has more branches. It's only a baby tree, but in the same way that babies give hope for the future, so trees and gardens inspire hope. The plants and seeds we put into the ground do not grow quickly necessarily, but they grow for the most part. Gardening teaches patience. Most of the daily work done in a garden isn’t instantly beautiful; it’s the cumulative effect of regular efforts that pays-off. Gardening gives us something to hope for as well as opportunities to see our hopes come to fruition if we practice patience, work steadily, and watch with hope. Sun, Apr 1, 2012 : 5:15 p.m.
Sun, Apr 1, 2012 : 5:14 p.m.
To me, serviceberries taste quite a lot like blueberries but with a slight hint of almond flavor. They've been a popular topic on our blog in the past: http://20minutegarden.com/2010/06/30/serviceberries-or-juneberries-or-sugarplums-shadberries-or-saskatoons/ And on annarbor.com too: http://www.annarbor.com/entertainment/food-drink/wildcrafting-ripe-serviceberries-found-all-over-ann-arbor/ http://www.annarbor.com/entertainment/food-drink/plenty-of-wild-berries-1/ This article by Edward Vielmetti contains information about where to find serviceberry trees (or Juneberry or saskatoonberries, as they are also called) on public properties. Sat, Mar 31, 2012 : 8:14 p.m.
How interesting! I've never tired a serviceberry. What flavor are they comparable to?